MKA Hotels is not holding any block space in Bonn at the present time. Most UN related meetings take place at the World Conference Centre Bonn or at the nearby Maritim Hotel Bonn. Any hotels between Bonn City and Bad Godesberg are convenient to these venues. 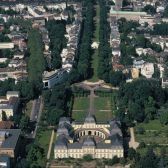 Bonn & Bad Godesberg are small cities and the distances to travel from one location to another are short and the Public Transport system is excellent. Below you will find a self-service site where you can make instant bookings on-line at best available rates. Credit card is required to guarantee hotel reservation. You can also select the language of your choice to read the hotel information. For currency converter click here.